I hiked up the west fork of the cold spring trail today. It was another short hike but wasn’t short on scenery. I have been taking it easy on my foot the past few weeks, it has been a little sore but is healing. There was no morning fog today, just intense sun from the get go. It was refreshing being under the tree canopy with the huge boulders and gurgling creek. I heard a warbler singing in the trees, not sure what kind. 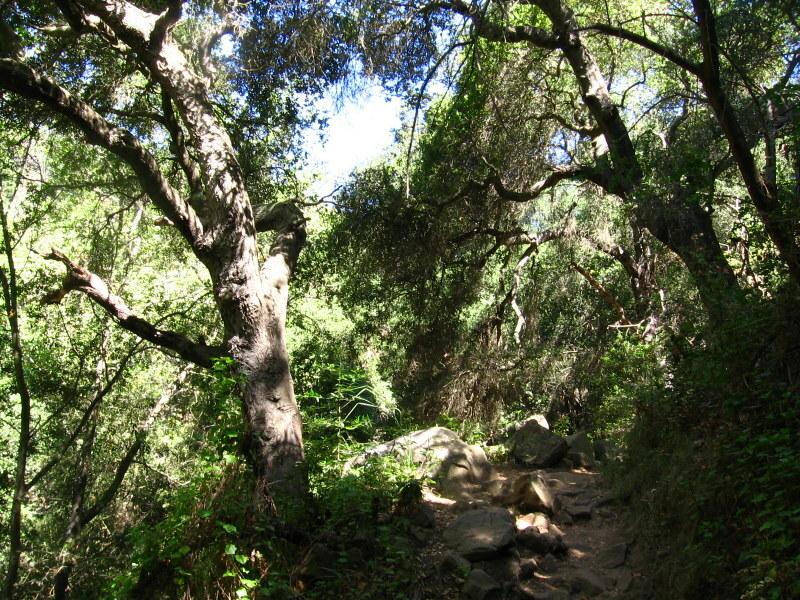 Coastal oaks in Cold Spring Canyon. Once out of the canopy and on the ridge the sun was very strong. I stopped and rested under a stray oak and made sure I stayed hydrated. 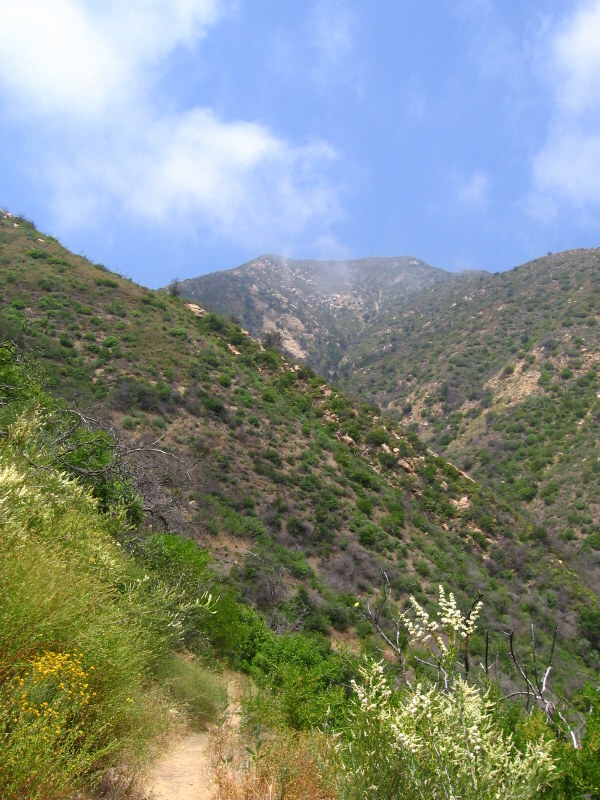 View toward the mountain crest from near the top of Tangerine Falls. 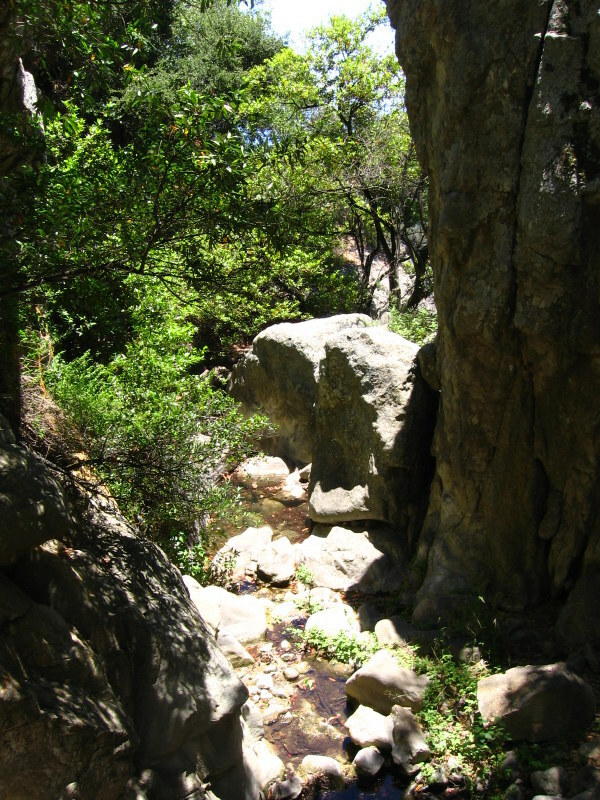 Once reaching the top of the ridge, there is a side trail leading to a rock crag above cold spring creek. It had great views of the ocean and when under the trees was several degrees cooler than in the sun. Luckily, the black flies which had been out in force all day, were fewer here. Some rock faces just above the falls. 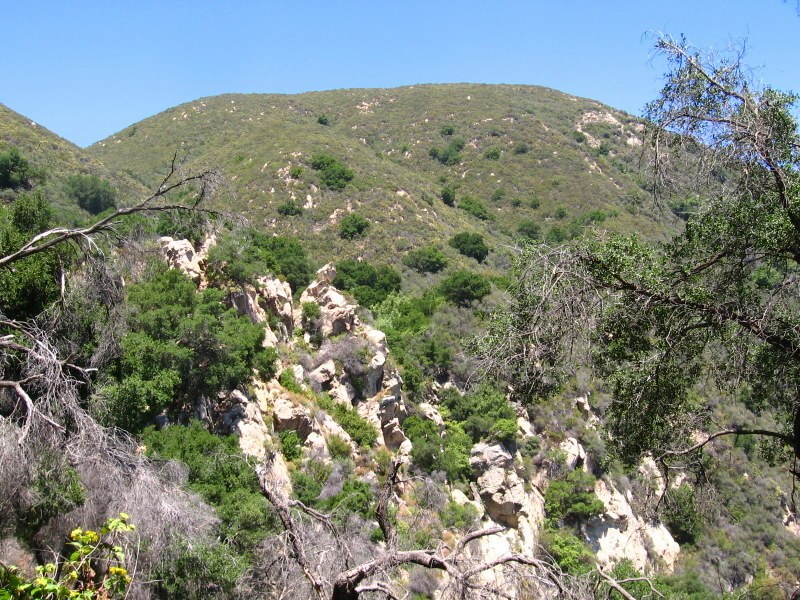 View south of Cold Spring Canyon from above Tangerine Falls. 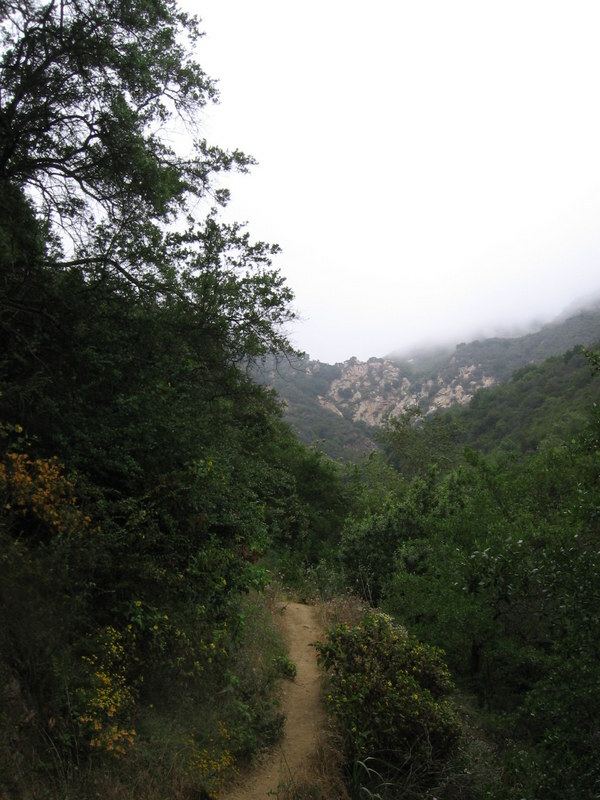 I then proceeded down another less traveled trail to cold springs creek, just above Tangerine Falls. It is very lush by the creek and has the feel of a large forest, even though it is a canyon with some steep wall sections. I heard some ravens calling near the top and heard what might have been a raptor, though I didn’t hear it clear enough to be certain. I saw some folks climbing by the falls up to the top, that would be a lot of fun I would imagine. 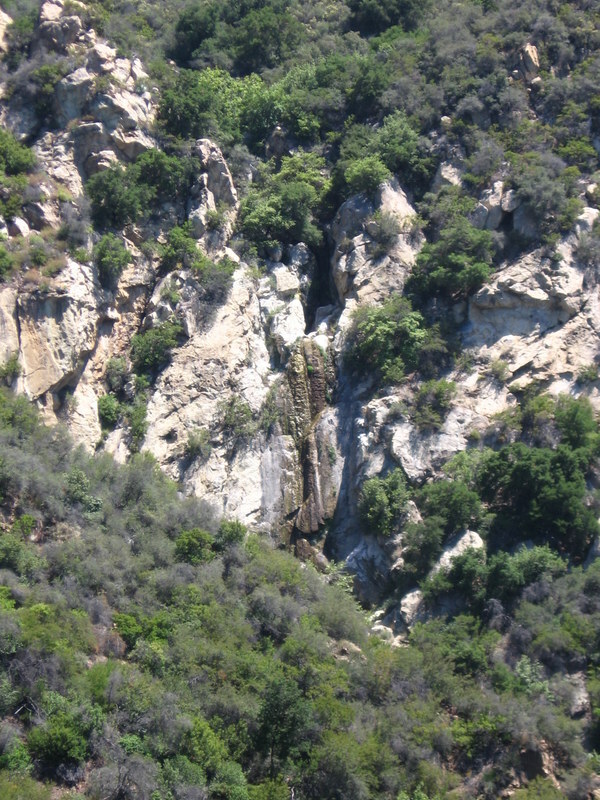 Rocky crags above the falls. These are fun to explore. 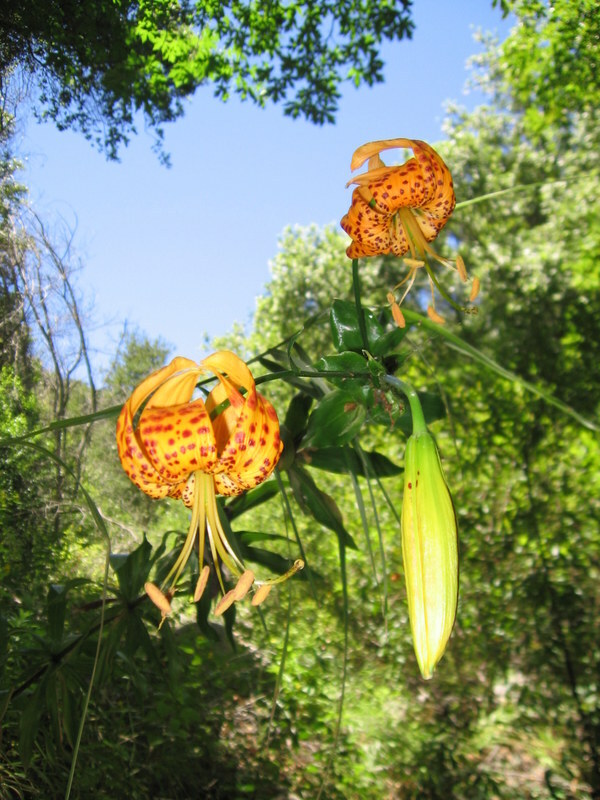 This entry was posted in Hikerweb on June 24, 2012 by jcammerota. It was a good morning to do some hiking. The cool ocean mist kept the temperature comfortable for exertion and there was not much need for sunscreen (yet). 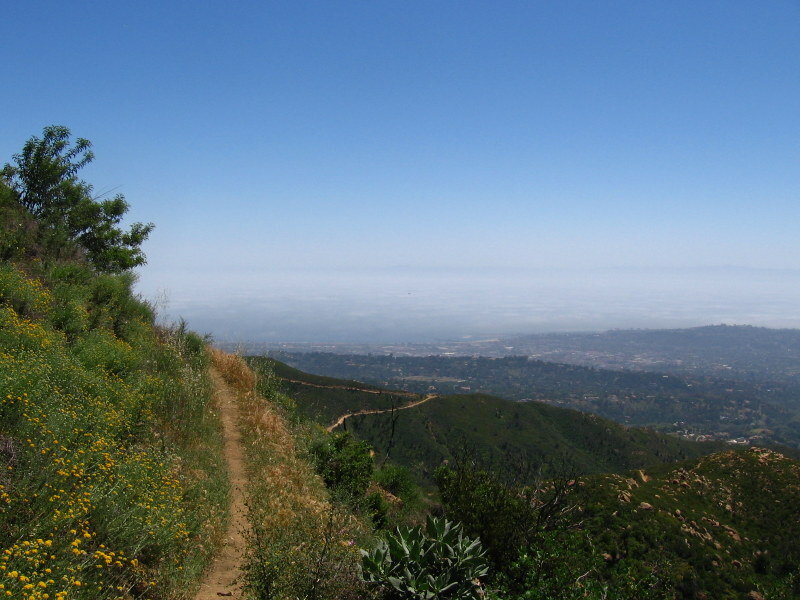 The marine layer still hovers above the trail. Once again there were wildflowers blooming everywhere and the bees seemingly welcomed the workload. They buzzed about busily and they seemed to be everywhere. Once I hit the exposed ridge out from the cover of the canyon, the sun was there to greet me. I was glad there was a cool breeze to keep things comfortable. The marine layer begins to burn off as I near the upper section of canyon. I saw three other hikers and a few mountain bikers after passing the cold spring tunnel. Not many good lunch spots after the trail leaves the canyon, I just chose a flat rock on the side of Gibraltar Road. The sun out in full force. Interestingly, when I reached Gibraltar Road there was an old vehicle down the side of the hill. It looked as though it had been there for a hundred years. Not much more than a mangled heap of rust and metal now, but I wonder why it is still there. Old vehicle by Gibraltar Road. This entry was posted in Hikerweb on June 10, 2012 by jcammerota. 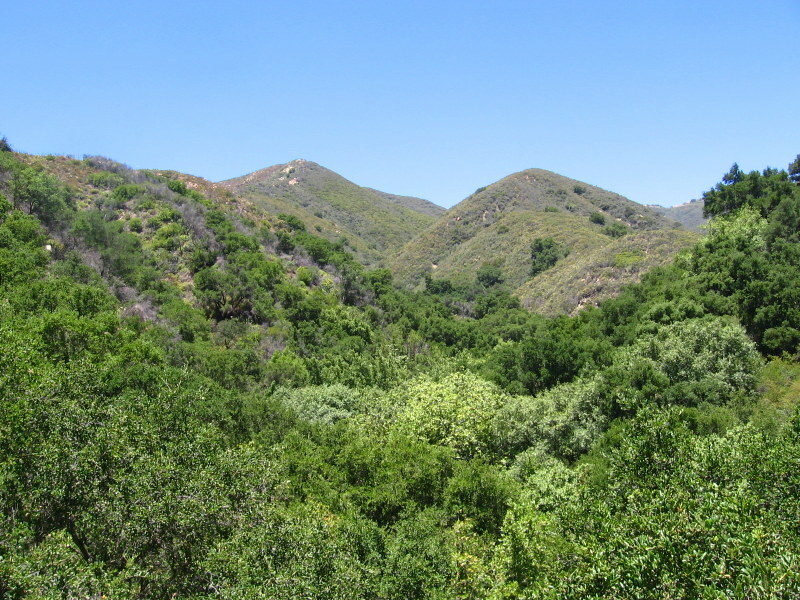 It seemed like a good day to take a hike up the Tunnel Trail along the side of Mission Canyon. One of the first things that I noticed was the abundance of blooming wildflowers everywhere. 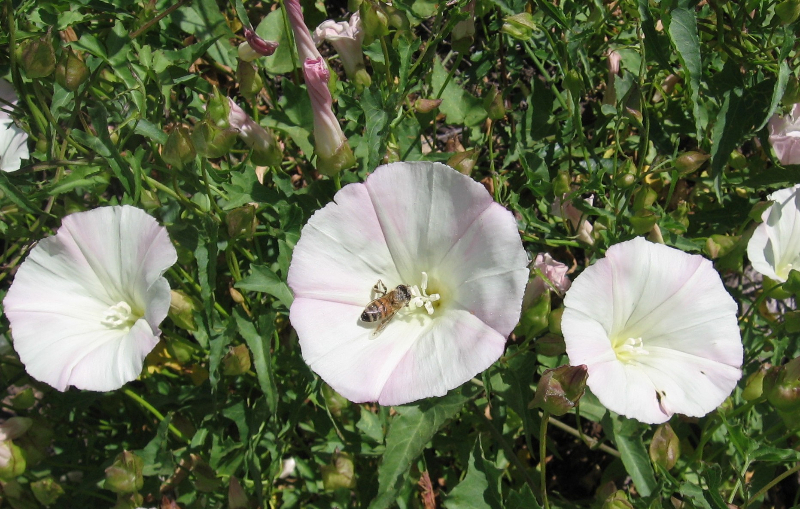 A honey bee crawling around on some morning glory. 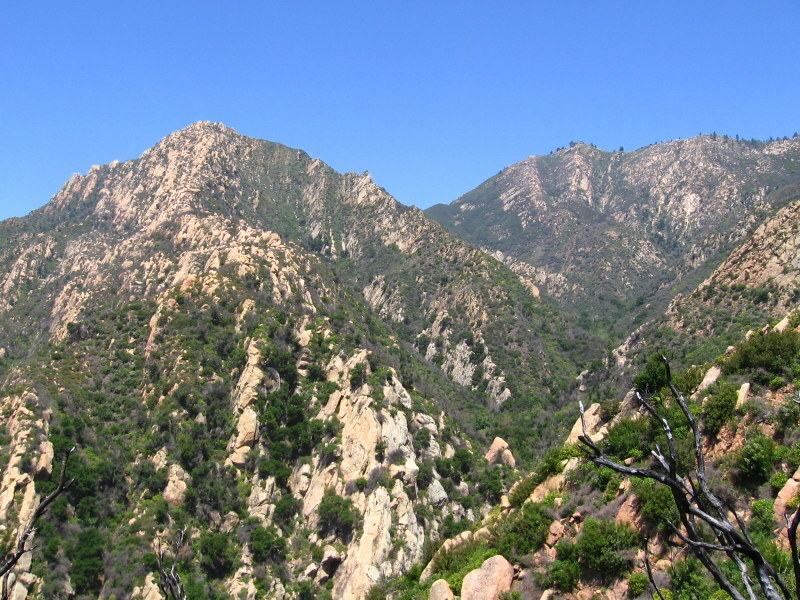 The plan was to hike up Tunnel Trail and connect with an unmaintained trail that follows the spine of the ridge in an area called Mission Crags. After breaking away from the gated road that allows access to the different trails in the area and heading up the actual Tunnel Trail the crowds dissapeared completely. 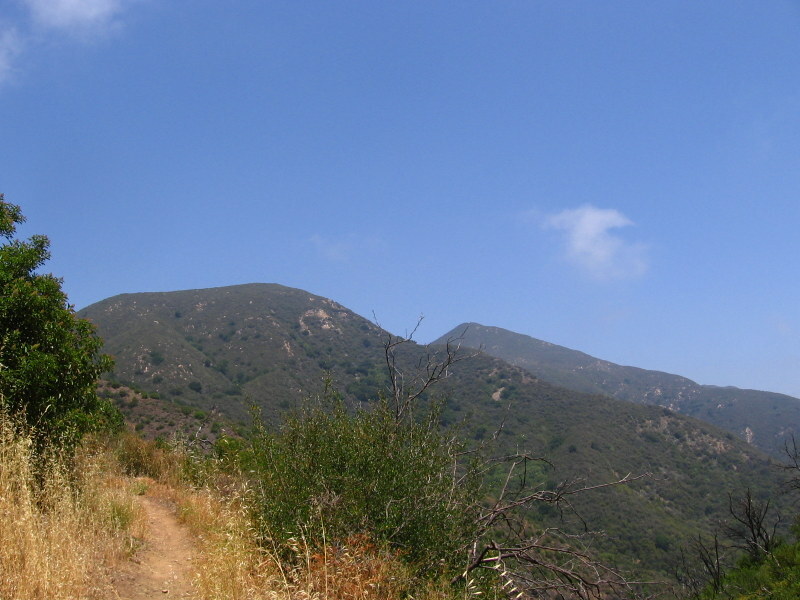 During the days hike, once on Tunnel Trail I only saw four other hikers and a group of mountain bikers. 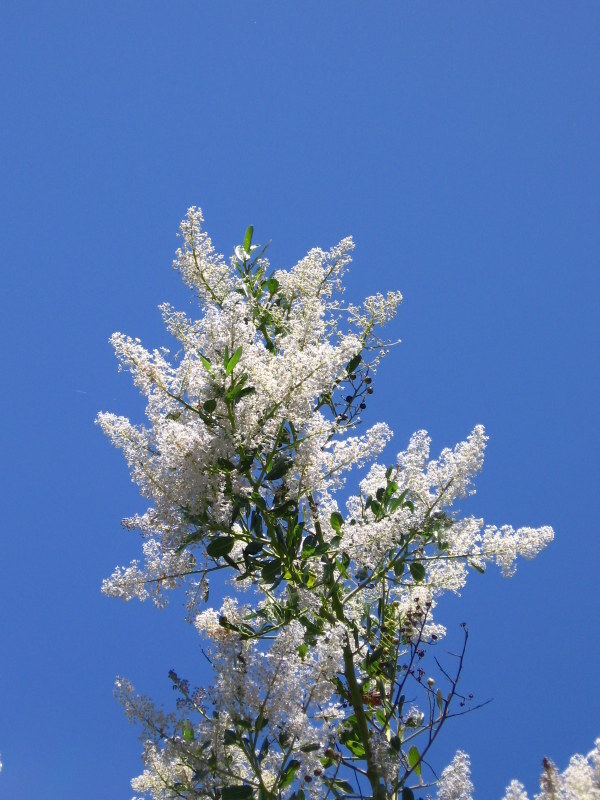 Ceanothus glowing in the sunlight. Gaining elevation toward the ridge. 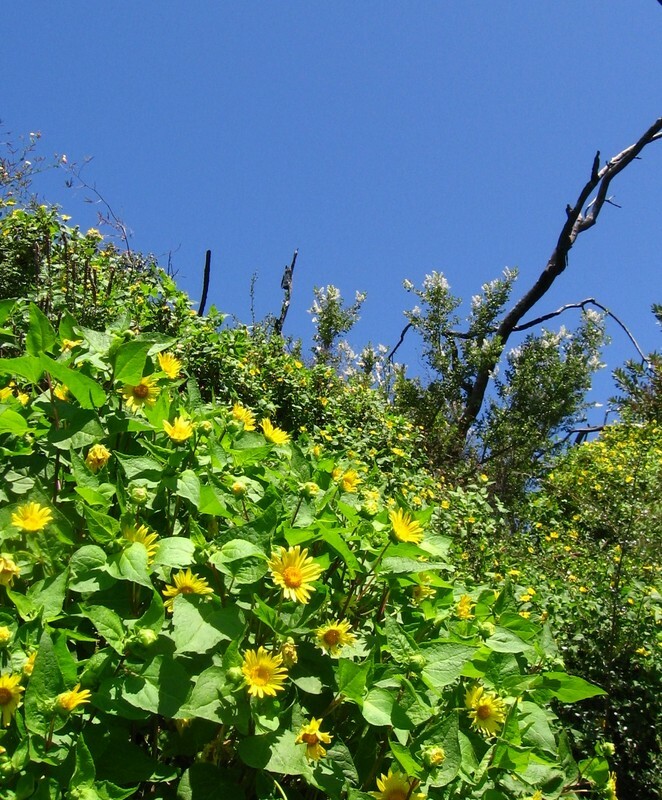 Canyon sunflowers and ceanothus along the side of the trail. 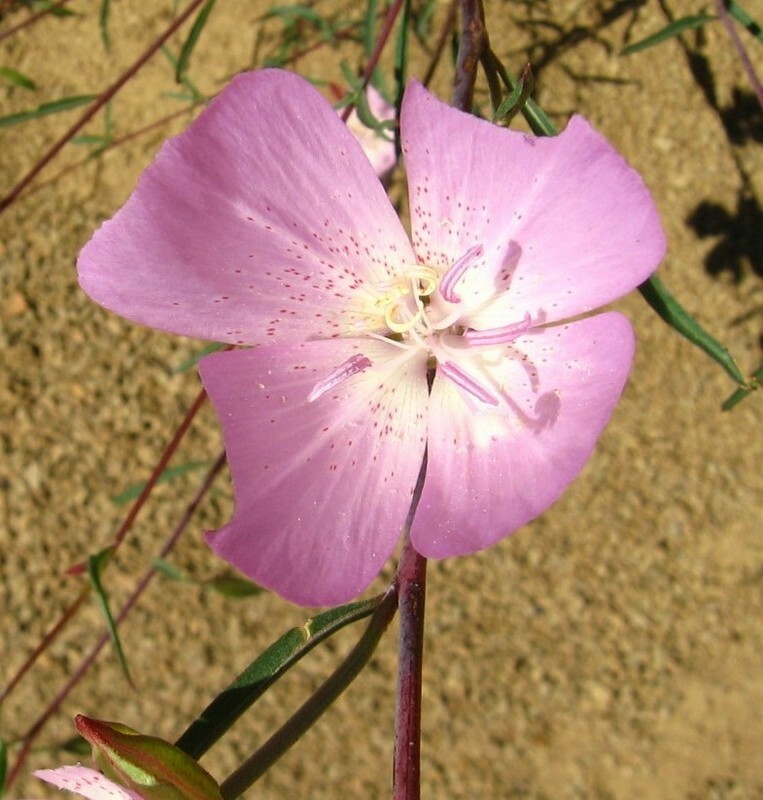 Both are common chaparral plants. The day was a little hazy by the ocean, so the views toward the Pacific were not as clear as they could be. 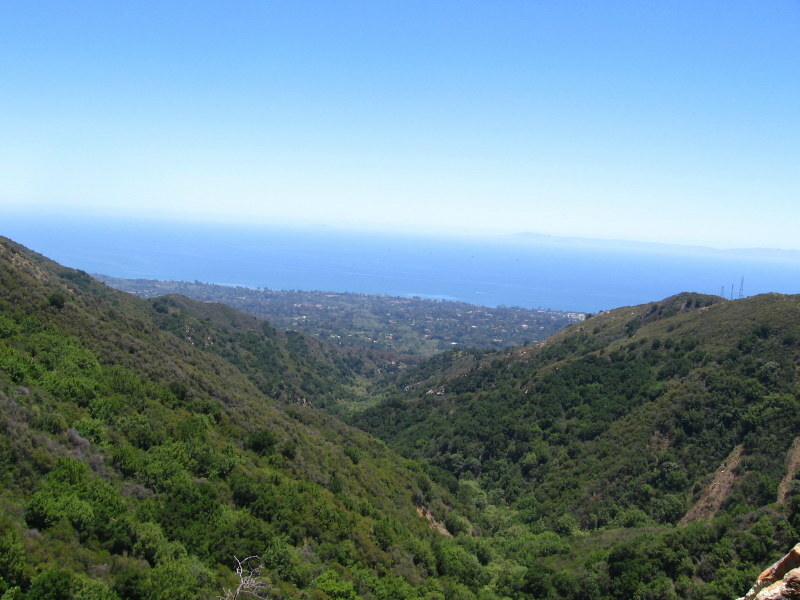 Sometimes the ocean is visible in many areas of this hike, but not today. No worries though, the many colored and varied wildflowers made up for the lack of clear coastal views. 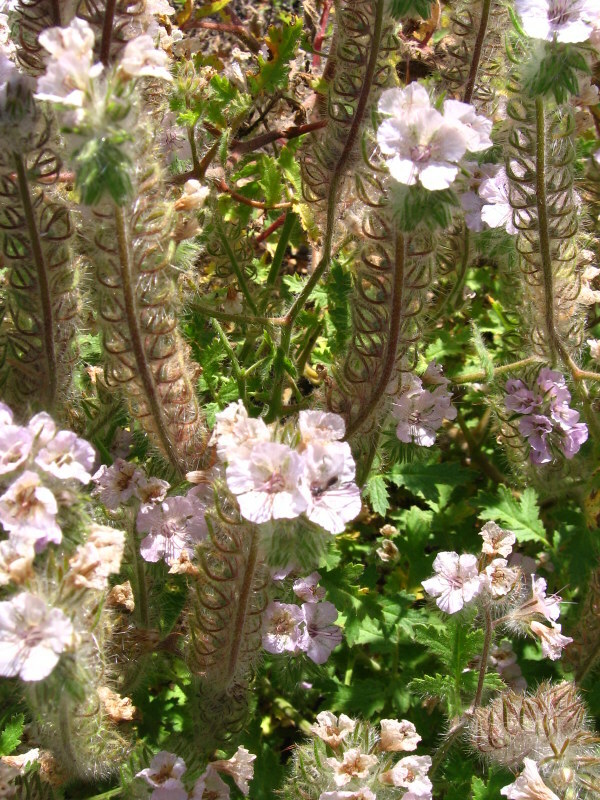 Caterpillar Phacelia – a drought tolerant native annual which blooms March through June. Once I reached the junction to turn off of the main trail, I proceeded through a bunch of thigh high flower bushes buzzing with armies of honey bees. 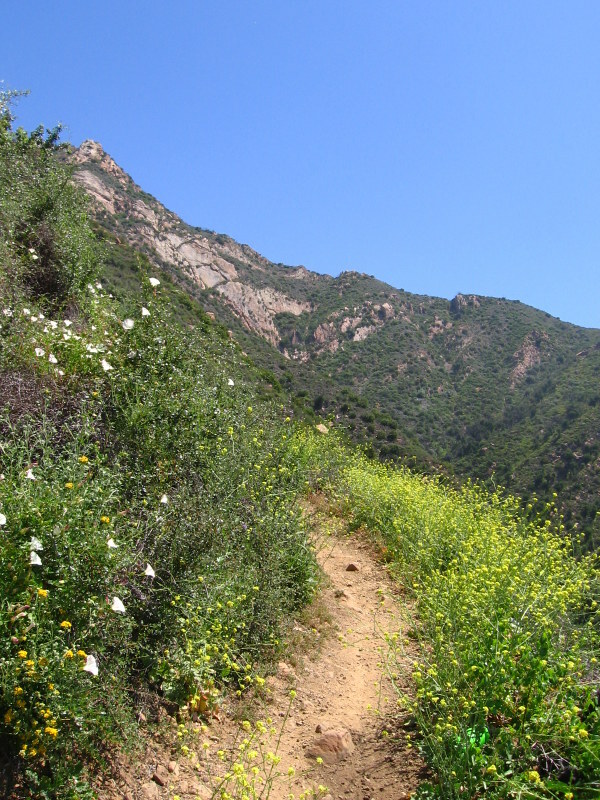 The tiny overgrown path soon became a trail across a small knife edge ridge with plenty of 360 views. Continuing along the trail soon became so overgrown that the areas buzzing with bees were more frequent and were soon going to be chest high. I decided that this was my cue to turn back and return here when there are less flowers and the honey bees are not out in full force. On the way down the mountain I noticed that the hazy marine layer toward the ocean had shrunk down a little and was now just covering the ocean like a snug blanket. The trail heading back, there is a light layer of clouds above the ocean. Downtown Santa Barbara is at the middle of the picture. This entry was posted in Hikerweb on June 3, 2012 by jcammerota.